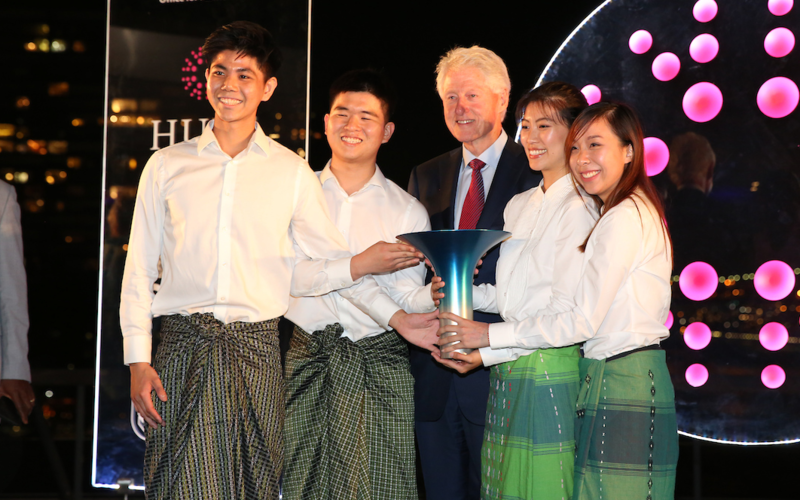 Rice Inc, a social enterprise aiming to alleviate food poverty in Southeast Asia, was presented with the Hult Prize trophy by President Bill Clinton. The team were supported by UCL Innovation & Enterprise. In recognition of their innovative social enterprise, four UCL students won the 2018 Hult Prize global finals at the UN in New York on Saturday 15 September. The Hult Prize is the world’s largest platform and accelerator for the creation and launch of sustainable and impact-centred startups emerging from universities all over the globe. Long-time supporter and advocate of the Hult Prize, President Bill Clinton, was on-hand at the awards gala to present the students with the prestigious trophy and a cash prize of $1m in seed capital for their award-winning business idea. The winners, BSc Biomedical Sciences students Kisum Chan and Lincoln Lee, Julia Vannaxay (BSc Statistics and Management for Business) and Vannie Koay (BSc Economics), are all about to begin their third year at UCL. They'll use the seed capital to develop their idea further, with the goal of ending food poverty in the Southeast Asia. Along with five other teams, the UCL team won the chance to pitch at the global finals having beaten 200,000 other ideas that competed at on-campus, regional and semi-final stages over the course of the year-long Hult Prize programme. The Hult Prize judging panel included esteemed industry leaders such as Arianna Huffington (co-founder of Huffington Post), Paul Polman (Global CEO, Unilever) and Hans Vestberg (CEO, Verizon). The panel saw the potential in the idea to increase the yield and quality of rice harvests by granting farmers access to drying technologies and a rice storage service. This year's Hult Prize challenge was to build a sustainable, scalable social enterprise that harnesses the power of energy to transform the lives of 10 million people. The winning idea does this by disrupting the traditional rice supply chain Southeast Asia. The team buys rice directly from farmers and dries it using renewable energy - avoiding the 30% spoilage rate farmers would normally incur when attempting to treat the rice themselves. Talking about the inspiration behind the social enterprise concept, CEO Lincoln Lee said: “Our heritage as a team shaped the project. We were shocked at how inefficient and wasteful the rice supply chain is. My team is made up of Malaysian, Laotian and Hong Kong nationals - countries where rice is the staple diet. Everyone eats it every day. Society would collapse without it. Having already put a plan in place for the £1m seed funding, the team is now working to put the money to good use by rolling out more pilot schemes to add to those already taking place in Malaysia and Myanmar in partnership with the International Rice Research Institute (IRRI). The student entrepreneurs had support from UCL Innovation & Enterprise’s Entrepreneurship team, UCL School of Management’s Dr Dave Chapman, UCL Hult Prize Campus Director Mascha Samkova, and external mentors including the Hult Prize’s Prof Evangelos Markopoulos. Their achievement is all the more remarkable considering the competition the team was up against in the global finals.